Happy sunny Saturday! 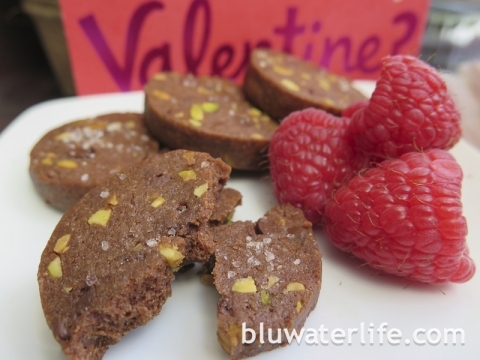 Tomorrow is Valentine’s Day and a perfect day for these Chocolate Pistachio slice and bake cookies. Well, really any day is perfect for these cookies! My friend Val from A Scrumptious Life made these for her cookie swap party and they went on my “must make” list. 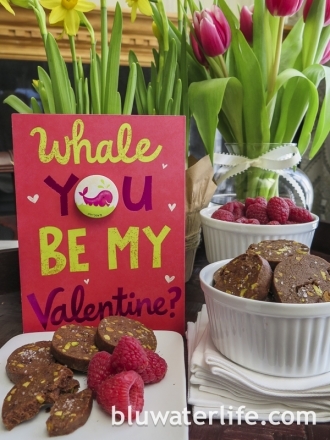 The chocolate made them perfect for Valentine’s. 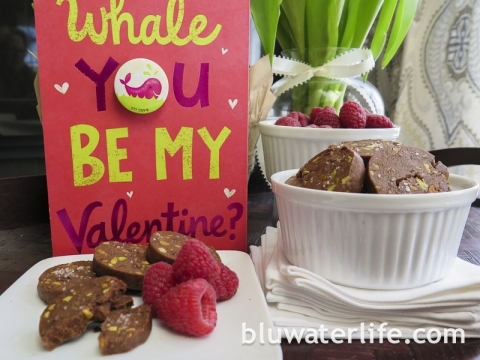 Don’t you love the bluwaterfun card? I hope Bluwaterguy doesn’t see this before tomorrow! 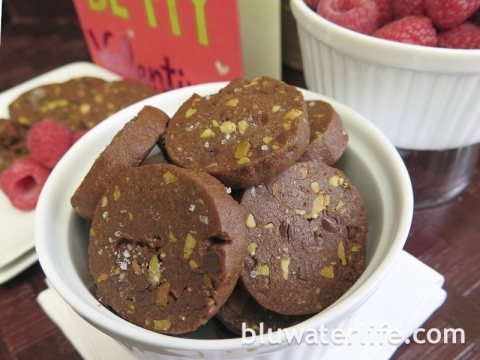 Chocolate bits, chopped pistachios and a tender cocoa shortbread cookie. Oh, and a sea salt sprinkle ~ which sends it to a whole ‘nother level of cookie rapture. Yep, don’t dare forget the sea salt sprinkle! 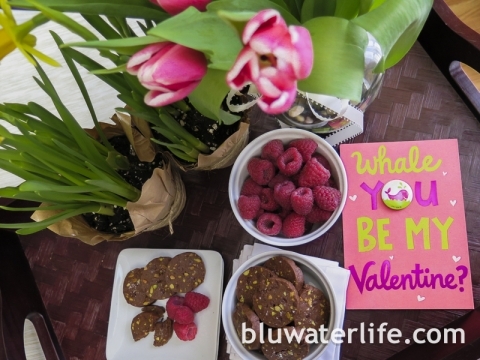 I added some fresh raspberries, which were delicious with the cookies ~ and spring time flowers. Sunshine, flowers and chocolate ~ guaranteed to chase away winter cobwebs, at least until the polar vortex predicted for next week! These Chocolate Pistachio Sables are originally from Bon Appetite magazine ~ click here for the recipe ~ or here for Val’s blog post and recipe. Here are some photos of my making and baking. These are a slice and bake cookie, so great to make ahead and chill or freeze, then bake when needed. I love slice and bake cookies for those reasons ~ like our Family Favorite Cheese Wafers. 1 ~ I’m a mise en place cook. Having it all together helps to get everything in the recipe! 2 ~ Wisk the dry ingredients together in a bowl, and cream the butter, sugar and vanilla ’til fluffy in another bowl. 3 – Add the dry ingredients to the creamed butter and sugar, and mix to combine. This is when I love my soft-start KitchenAid hand mixer. No flour clouds here! 4 ~ After the dough comes together, add the chocolate bits and chopped pistachios. I chopped the pistachios in my KitchenAid chopper, which I’ve had for years! 5 ~ I found it easiest to combine by using my hands ~ the same way I do with the Cheese Wafers. 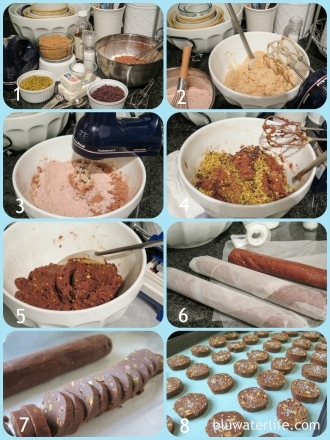 6 ~ Roll the dough out into 3 or 4 logs, and wrap in wax paper for the fridge. Chill at least 4 hours or overnight. I recommend overnight as it helps with slicing if the dough is really cold. 7 – Slice into 1/4 inch rounds for baking. 8 ~ Lay out on a baking sheet on parchment or a silicone baking mat, and sprinkle with sea salt. Bake at 350 degrees for 12-15 minutes. Cookies will be soft when they first come out, but firm up as they cool, so don’t over-bake. Makes about 8 dozen delicious bite-sized cookies! fried ravioli appetizer ~ yum!